The Public Opinion Foundation (FOM) just published a major poll looking at Russian attitudes toward the callup and obligatory military service. It’s 48 pages, but here are some highlights. The poll was conducted in July, with 3,000 respondents in 204 populated places in 64 of Russia’s regions. Fifty-two percent of respondents favor a mixed manning system combining conscription with contract service, and 23 percent favor the callup only. Sixty-four percent support the announced plan to cut conscripts and increase contract soldiers, although only 22 percent would support taking money from education and health care to pay for them. Survey participants on average thought 34,500 rubles was worthy pay for contractees. Fifty-five percent liked reducing conscript service from two years to one while 37 percent did not. In the 18-30 age group, 65% supported the shorter service term. In the population as a whole, 29% believe one-year service has reduced dedovshchina and “nonregulation relations” against 46 percent who feel nothing’s changed by it. There were fewer of the former and more of the latter among respondents claiming intimate knowledge of army life. The FOM poll showed strong support for a number of Defense Ministry initiatives to “humanize” conscript service. Fifty-four percent were critical of draft evaders, but 34% were sympathetic toward them. 19% said it will improve. 19% said it will worsen. 35% said it will stay the same. 26% said hard to answer. However, when asked to compare military service conditions today against those 10-15 years ago, more respondents said they are easier (39%), and many fewer said they are harder (14%), by comparison with Russians asked the same question in 2002 (just 6% and a whopping 64% respectively). Komsomolskaya pravda’s Viktor Sokirko had an interesting article today about life in a disbat — a disciplinary battalion. It features a rather idyllic video showing some of the inmate-soldiers’ daily activities. Sokirko says only two disbats remain, and he was invited inside one to see a “prison in shoulderboards.” The 28th Independent Disciplinary Battalion looks like other units with barracks, parade grounds, etc. But it also has barbed wire, guard dogs, and a security company. The acting commander says he has 162 men under guard, although he could accommodate 800. Most are inside for “nonregulation relations” or dedovshchina. There’s also theft, extortion, AWOL, and less often, desertion. One Russian conscript from Abkhazia is serving 6 months for refusing to scrub the barrack floor. He adopted the “law of the mountains,” and refused to do “women’s work.” Another, a sergeant, got two years for rupturing the spleen of a soldier who cursed him for sending him to clean the latrine. The acting commander says his charges aren’t beaten or thrown into pits, but simply forced to march in formation and live strictly according to regulations (including learning every line). And there’s cleaning the barracks. If they don’t toe the line, there’s the guardhouse, and no one wants to go there, so even the proud and independent Caucasians follow orders. More than half the inmates — 96 — are North Caucasians. 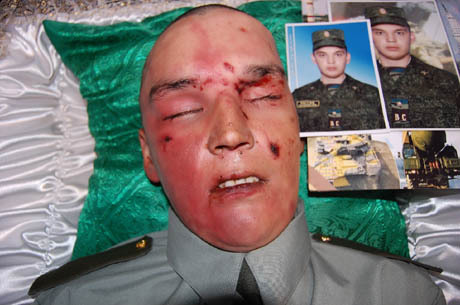 The article claims only 2 percent of the Russian Army is drafted there, but half the men in the disbat are Caucasians. Inmates don’t get a permanent record from time in the disbat, and the command claims only 5 percent of its former inmates become criminals subsequently. Interestingly, Rossiyskaya gazeta wrote about the disbat in 2009. It said there were still 5 disbats with about 1,200 inmates in all. It noted, while they don’t get a record, their disbat time doesn’t count, and they still have to complete their conscription term. RG said 40 percent were serving time for AWOL, about the same for dedovshchina, and the rest for other crimes. 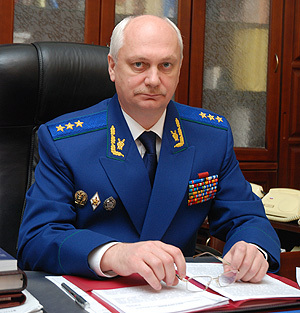 Sergey Ivanov had proposed the guardhouse as a replacement for the disbat. Disciplinary cases would go to the guardhouse, and any soldier committing a crime not covered in the regs would be handled in civil court and prisons. But Anatoliy Serdyukov didn’t support the plan to build and rebuild guardhouses. Of course, he also claimed the disbat provided a better chance to get a guy back on track. Not again . . . but yes, Wednesday Trud asked what kind of army does Russia need in the future? It’s almost 20 years since the army ceased to be Soviet, and the paper asked five relatively independent experts the same question that’s been asked since 1991 –what is to be done about Russia’s Armed Forces? Yes, it’s repetitive . . . it’s rare we hear something new, the problem is not ideas and initiatives, it’s implementing them. At the same time, these commentaries are short and pithy. They cover a lot of ground, and might be handy. Korotchenko supports the Defense Ministry’s swerve back toward contractees, since there aren’t enough conscripts. And he doubts conscripts are up to the task of handling modern weapons. But he points to the need to end dedovshchina and other barracks violence to attract professional enlisted. Sharavin believes the big mobilization army is still needed, and conscription will continue alongside contract service for some time. He wants more benefits for conscripts who’ve served, and he wants the sons of the bureaucratic elite to serve. Belozerov agrees recruiting 425,000 professional soldiers won’t be easy or fast. Litovkin is harsher; he says there’s no reform, just back and forth on contract service. He lampoons the current small-scale effort to train professional NCOs. He ridicules thoughts of a serious mobilization reserve because of the lack of reserve training. Makiyenko thinks a contract army is cost prohibitive, and the army numbers only about 800,000. He likes the fighting spirit of soldiers from the Caucasus, opposes segregating them, but hopes Muslim clergymen in the ranks can restrain them. The Pacific Fleet command and investigators say the shooting of a 22-year-old lieutenant assigned to a 35-year-old LST in Fokino was a suicide attempt, and not the result of ‘nonregulation relations’ or dedovshchina. The incident occurred 1 December. 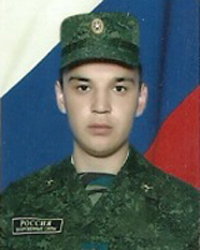 Lieutenant Maksim Kuropatkin was found with a gunshot wound to the head, and he remains in a coma. Investigators say he shot himself with his service sidearm in the presence of two witnesses. No criminal case has been initiated. Their preliminary conclusion is that Kuropatkin suffered a nervous breakdown caused by difficulty adapting to life in the service. Moskovskiy komsomolets point out the Kuropatkin case is a little special because President Dmitriy Medvedev was the surprise guest of honor at the lieutenant’s wedding in early July. Medvedev was touring the Far East, and arrived at Birobidzhan’s wedding palace in time to witness three marriages including Kuropatkin’s. 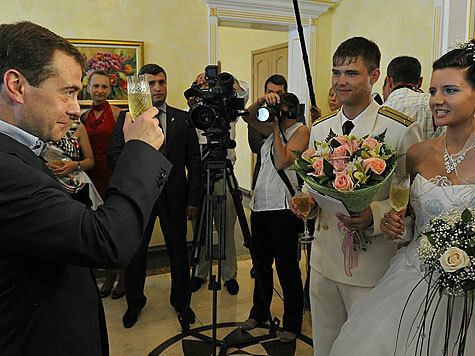 Medvedev wished the lieutenant and his bride a “long happy family life.” He ordered the governor of the Jewish AO to find apartments for all three couples. About a month ago, the Kuropatkins got their apartment. Kuropatkin’s family doesn’t believe his shooting was a suicide attempt. They say he was always goal-oriented, and aimed for a military career from age 14 (presumably he attended a Nakhimov Naval School). He graduated from the Pacific Naval Institute late this spring, married, and had been in his first assignment only a couple months. RIA Novosti also reported a Baltic Fleet suicide this week. A 23-year-old lieutenant from the Pionerskiy garrison reportedly shot himself in the chest with a Makarov pistol. He apparently left a note. The chair of the Kaliningrad Committee of Soldiers’ Mothers said she was completely surprised by this incident, adding that there have never been “any signals” of problems from the unit where this lieutenant served.